The Plenty is a handheld vaporizer from German manufacturers Storz and Bickel. The device also comes with a pad for vaping concentrates or any waxy oil. It’s a bit of an in between, as it’s not exactly a desktop vape, because you need to press the button while holding it to operate the device. But since it must be plugged in, it’s not a portable vaporizer, either. Regardless, it is still an impressively designed convection heat vaporizer with a large chamber that delivers high quality vape hits. Is it the right indoor vape for you? Read on and you are the judge. Usually we include a section explaining batteries on portable vaporizers, but since the Plenty needs to be plugged in for use, that isn’t necessary here. When you are ready for a vape session using the Plenty, hit the switch and that will power the device. Next, choose your temperature and the Plenty will start climbing to your desired temperature while you’re holding the trigger down. Do not set the Plenty down while it is heating up, because the heating process can only be activated when the trigger is held in. Watch for the LED light to turn on, letting you know it’s ready. After that, load up the heating chamber on the Plenty and connect it to the device. Finally, connect the Plenty’s mouthpiece at the top of the unit and make sure it is securely fastened shut. With the Plenty in fact, you’re ready for some tasty rips by inhaling through the mouthpiece. The Plenty is ideal for parties or for passing around in groups of 2 to 4 people. The fact that it only can be operated one way isn’t an asset, but it’s also not a huge drawback for most users that say they enjoy using the Plenty. This handheld device has a relatively standard, slightly below average heat up time for desktop/ indoor vaporizers of around five minutes. Sure, there are desktop vapes that are ready for ripping much more quickly than that, but the vapor quality, the temperature range and the ease of use and especially the big chamber on the Plenty do tend to make up for some of its drawbacks when you ask most users. The Plenty handheld vaporizer comes equipped with seven different heat setting that are pretty impressively wide ranged. The temps range from 37°C to 215°C – 99°F to 419°F. A minor drawback in the temperature department is the fact that the dial is not as precise as we might have liked. Storz and Bickel sort of make up for this drawback with the analog display on the Plenty that will tell you about what temperature you are at. It could be more accurate, though. Although the Plenty is straightforward and easy to use, save for one minor, potentially confusing aspect that we touched upon briefly earlier. The button used for heating must be pressed down to heat the device, and newbies might not realize that needs to be done every time the LED light shuts off, indicating it’s not hot enough for rips anymore. Most users get the hand of it quickly though, and realize this relatively insignificant quip within one or two times of not understanding it. The Plenty has a strange appearance that is rather unlike most desktop vaporizers – it kind of looks like a power tool because of the mouthpiece connected directly to the coils for cool down. Some users, especially those who are the handyman type, think this is kind of cool. Others might find this design a bit clunky and awkward. We are pretty neutral when it comes to an opinion on this, leaning more towards it looks kind of cool than not. For this reason, we aren’t going to make a judgment call as to whether its appearance is a pro or a con – you will have to be the judge of that for yourself if you’re mulling over a decision to buy yourself a Plenty. 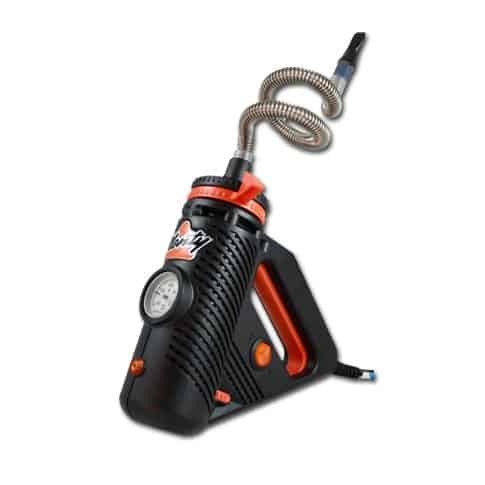 Storz and Bickel are well known in the vaporization game for building units that last. Because of this, coupled with its delicious vapor hits, many users overlook the potentially negative quirks that might come along with this vaporizer. Its tubes made from stainless steel help cool down every toke, making them delicious. The convection heating of the unit also adds to the great flavor of vape rips. You will be able to blow thick vape clouds with the Plenty that rival that of just about any other desktop or indoor vaporizer. What Comes With the Plenty Vaporizer? Not much can be added when it comes to accessories for the Plenty. What you see is what you get with this unit. The device includes a pad that allows you vape liquids, a cleaning brush, a long tube and a short tube and the instruction manual. The Plenty comes with a 3-year warranty. What do you think about the Plenty? Do you own one and love it? If not, please tell us why. Let us know your thoughts in the comments. Check back right here to Tools420 for more great reviews just like this one. Follow us on Facebook, Twitter and Instagram pages and signup to our Newsletter to receive more news, updates and promotions. You could even win a prize! Check back right here to Tools420 often because we update our pages frequently. Until next time, it’s 4:20 somewhere! Happy vaping!